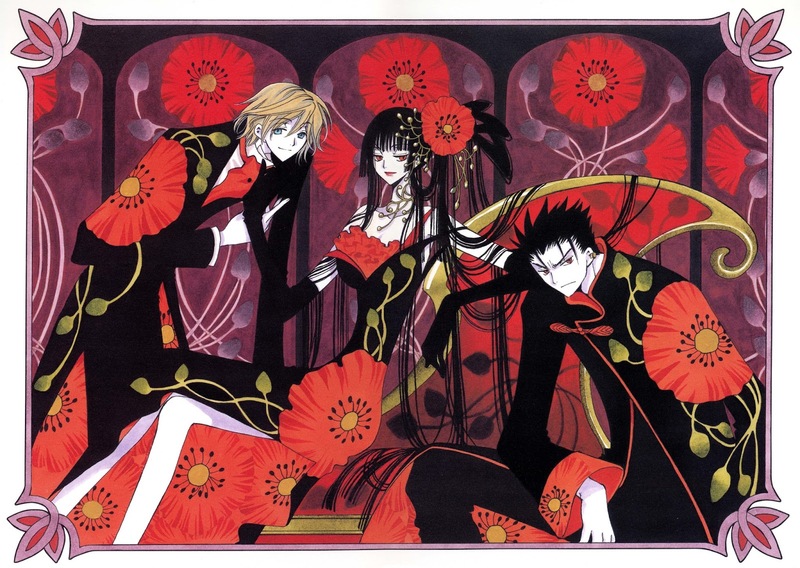 Normally Yuuko would not be a cosplay that I would have on my immediate list of things that I need to get done but I stumbled across this beautiful artwork that piqued my interest. 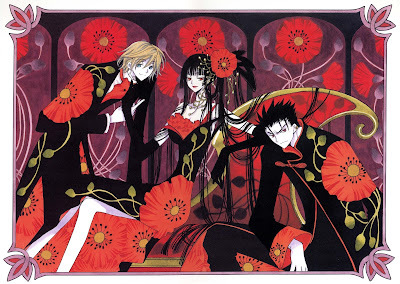 I shared it with Tsuki no StarDust who also love Clamp, jokingly saying that we needed to make this group cosplay one day. Well they also loved the designs and we decided to make the group right away! It was my first time working with these lovely boys and we had so much fun together! Dress - The dress was based off of the Tom and Linda Platt pattern supplied by Vogue (V1474). 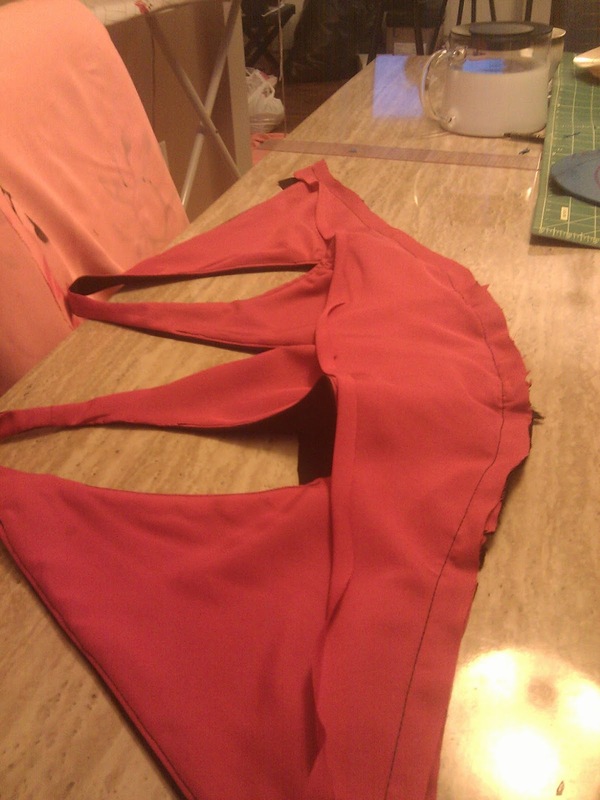 I modified the pattern so that the bodice and skirt were separate from each other. The top was further adjusted by changing the thickness of the shoulders and adding a floofy insert in the bust. The skirt's slit was brought to the front side. StarDust was in charge of all the airbrushing. 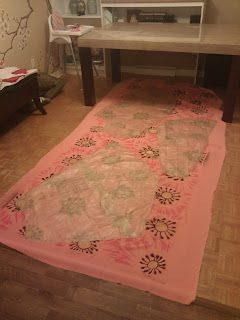 Once the pattern was made on the orange fabric, the skirt lining was cut out and assembled. One flower was cut out and hand sewn onto the rear of the skirt while another was cut out to create the hair piece. 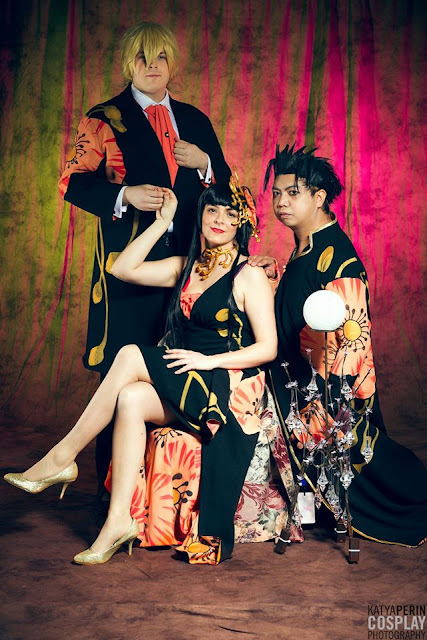 To get the vines to line up properly on the dress, the skirt and bodice were partially assembled and pinned for airbrushing. The skirt was finished by bag lining it and adding a waistband. The skirt is closed along the slit by a small zipper. The bodice was lined with red lining fabric and detailed with the orange insert. Velcro strips were sewn along the inside of the bodice and the outside of the waist band to keep the two pieces from separating. Gloves - The gloves, originally for a Delphine Eraclea cosplay, were handmade and made out of a black knit fabric. 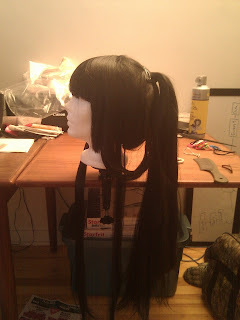 Wig - I used a black wig in the style of Mio from Purple Plum Inc. I trimmed the bangs to get a natural but blunt cut and cut some of the side locks to create the longer side bangs Yuuko has. I separated two locks from each side of the wig and set them aside. 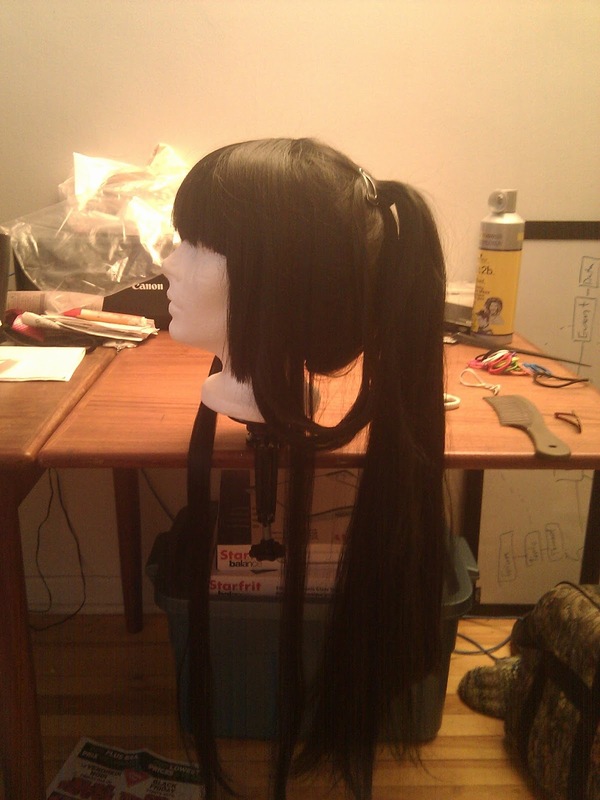 I gathered the rest of the hair and made a high side ponytail. 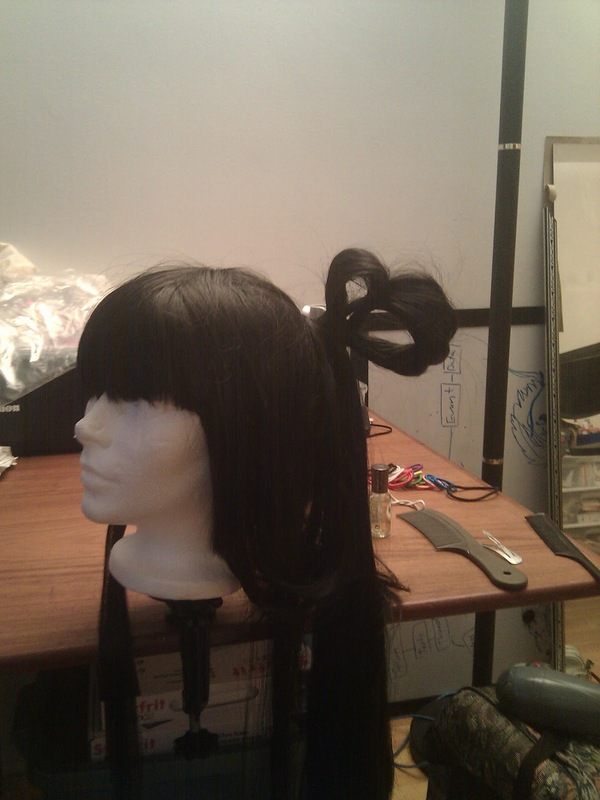 I took part of the left lock of hair and draped it over the top of the ponytail and pinned it in place. To make the hair loops, I separated the ponytail into three pieces, Each piece was hair sprayed underneath and heated with a hair dryer. Clear nail polish was applied to the underside and the lock was held up until it dried. A loop was made and tied with black embroidery floss. I started from the top piece and worked my way down. The hair loops were tied to each other to give added support and the excess hair was wrapped around and through the loops to hide the wefting and messiness and held in place by bobby pins. Accessories - The hairpiece was made with scrap worbla, a small comb and the fabric flower. The worbla was heated and rolled into thin cylinders. To create the hairpiece the cylinders were attached and shaped to a rectangular piece of worbla on a flat surface. The longer vines were made first and then joined by the smaller ones that cross over and under. 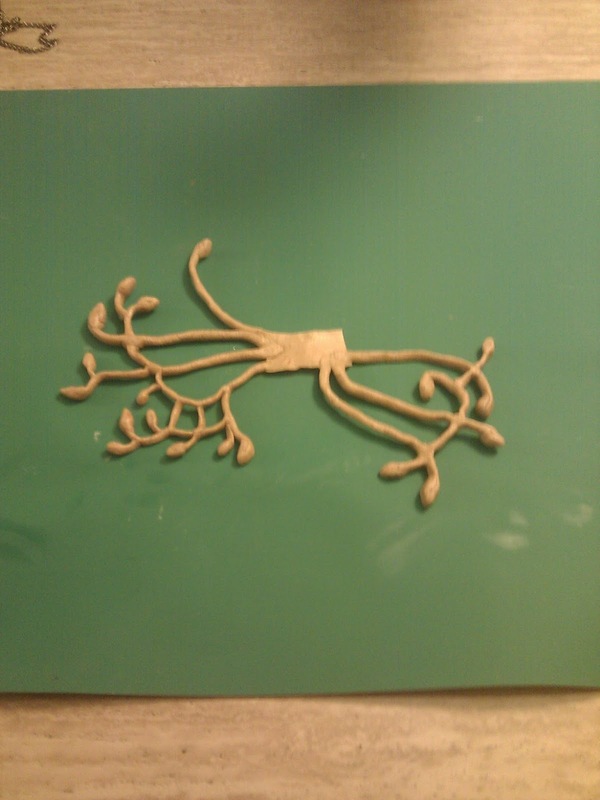 The buds were shaped once all the vines were created. The completed piece was shaped on last time by placing it on my head and shaping each vine one by one until I was satisfied with the result. The necklace was made using friendly plastic and made using the same method as with the hairpiece. 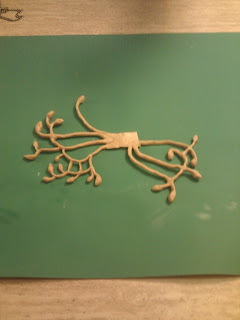 Both the hairpiece and the necklace were primed with gesso and painted with gold acrylic paint. They were aged by painting brown paint all over and removing the paint with a paper towel. The necklace closes in the back with a ribbon threaded through the ends of the vines. The hairpiece was finished by gluing the comb to the back of the base and gluing the fabric flower to the front.